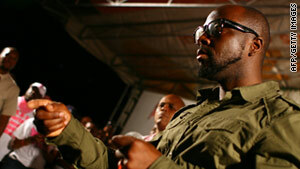 Hip-hop singer Wyclef Jean was recovering Sunday after he was shot in the hand, his publicist said. Spokeswoman Cindy Tanenbaum said Jean, who was in Haiti, was shot in Port-au-Prince on Saturday -- on the eve of the country's presidential runoff vote. The wound was superficial and "he is doing well," Tanenbaum said. Jean suffered the wound soon after stepping out of his car to talk on his phone, according to Gerry Andre, his spokesman in Haiti. "He heard a gunshot, then he saw his right-hand palm was bleeding," Andre said. Jean was treated by a doctor at a hospital and released, Tanenbaum said. Andre said it was not clear if Jean was a target of the shooting. "I cannot accuse anybody," Andre said. The police investigation was stalled by Jean's refusal to speak to police about the incident, according to Garry Desrosiers, a spokesman for the Haitian national police. Jean has been helping the presidential campaign of popular musician Michel Martelly, who is on the ballot against former first lady Mirlande Manigat in Sunday's pivotal presidential runoff election. "It was nothing," said Damien Merlo, a spokeman for the Martelly campaign. "He's fine and out and about getting out the vote for us." Final results of the runoff will be released on April 16, according to officials. Jean, who was born in Haiti, shot to fame in the mid-1990s as a member of the Fugees, a U.S.-based hip-hop and reggae group. He now performs as a solo artist. He has been an outspoken proponent of Haiti through his Yele Haiti Foundation and was one of the first celebrities to offer aid after the last year's devastating earthquake. In September, he officially ended his bid to be president of Haiti a month after election officials ruled that he was ineligible to run. Jean previously vowed to fight the Haitian electoral council's ruling that he was not a resident of the country. His eligibility had been in question after claims that he had not lived in Haiti for five consecutive years prior to the election, a requirement in the nation's constitution.